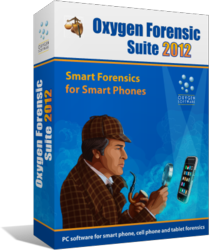 Oxygen Software updates Oxygen Forensic Suite 2012, the company’s flagship mobile forensic tool, offering investigators a greatly improved usability while providing access to even more information than ever. The newly introduced GEO Data bookmark enhances the Timeline section by presenting suspect’s activities accompanied with geolocation information in a single view. By grouping the activities by date, time and geographic location, investigators can quickly review suspects’ activities at a given time and place. The latest release of Oxygen Forensic Suite 2012 introduces the ability to recover information about calls and messages deleted by the phone owner by analyzing raw data available in Event Log and Messages sections. The new feature provides investigators with side by side access to actual and deleted mobile and FaceTime calls, SMS and MMS messages, emails and iMessages. Finally, the updated version of Oxygen Forensic Suite 2012 provides enhanced support for BlackBerry smartphones, enabling investigators to access uploaded BBB backups or data extracted from a BlackBerry device in a single section. The newly added Source BlackBerry Tables section employs IPD Viewer to display BlackBerry database sources at a single location. In addition, BlackBerry Messenger contacts and correspondence can now be displayed. The GEO Data bookmark allows experts to obtain geolocation information from the device, locating places where the suspect used their mobile device. Oxygen Forensic Suite 2012 enhances the Timeline section with the addition of GEO Data bookmark. The GEO Data bookmark allows experts to obtain geolocation information from the device, locating places where the suspect used their mobile device. The addition of geolocation view allows investigators analyzing events that occurred at a certain location. In addition to standard Timeline features, the new tab offers Google Earth exporting. Oxygen Forensic Suite 2012 obtains geolocation information from multiple sources, including phone’s IP connections, cellular points, WiFi points, WiFi Connections, and EXIF information stored in pictures taken with the camera phone. The source of geo coordinates is displayed in the new GEO Data tab. Raw coordinates are available in a separate column, while an exact map pinpointing the location can be displayed in a separate window. The tool can create a route by connecting the location points, and export geolocation information to Google Earth via a KML file. Geo Timeline supports a number of iOS and Android applications. For iOS devices, geolocation information is extracted from Foursquare, Evernote, WhatsApp Messenger, Twinkle, HeyTell and other apps. Geo data for Android phones is extracted from Twitter, Web Browser, HeyTell, Mobile Spy, WhatsApp Messenger, Remember The Milk, Facebook, Google Maps and a number of other applications. 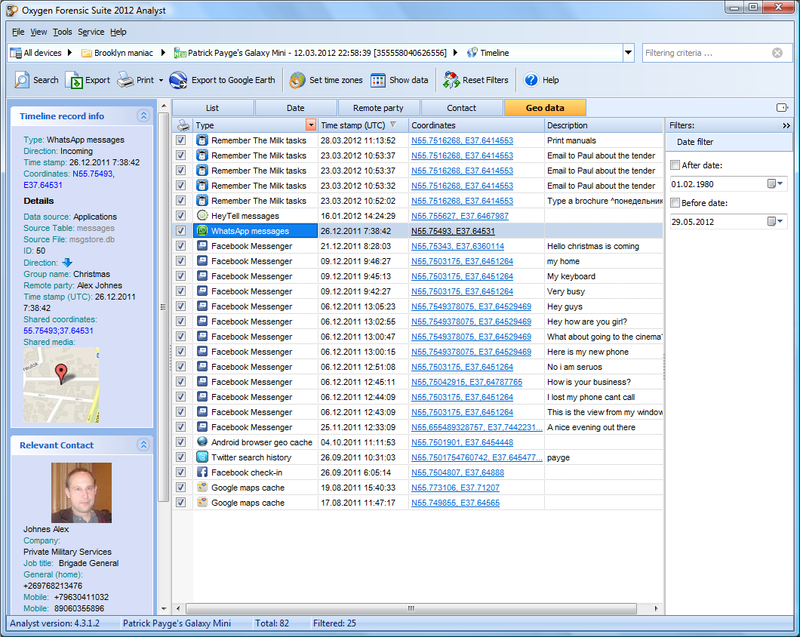 The latest release of Oxygen Forensic Suite 2012 introduces in-section analysis of deleted data. Available for Event Log and Messages sections, the new feature allows investigators accessing mobile and FaceTime calls, SMS and MMS messages, emails and iMessages that were deleted by the phone owner. Having the ability to viewing actual and deleted items side by side helps reconstruct the crime scene without having to manually carve raw data files. The newly added Source BlackBerry Tables section visualizes uploaded BBB backups or data extracted from a BlackBerry device in IPD Viewer, allowing investigators to conveniently access source BlackBerry databases at a single location. Previous versions of Oxygen Forensic Suite 2012 were only providing access to parsed BlackBerry data in the many available sections. The new release adds the ability to review the entire extracted database in a single view. In addition, support for Blackberry Messenger contacts and correspondence has been added to allow accessing BlackBerry Messenger information extracted from BBB backups. The data is available for BlackBerry Messenger 6 and newer. Oxygen Forensic Suite 2012 helps investigators and forensic specialists access and analyze data from a variety of mobile devices such as cell phones, smartphones, communicators, PDA and tablet PCs. Currently supporting more than 5,200 different models, Oxygen Forensic Suite 2012 covers the widest range of mobile devices compared to competition, and allows fully automated acquisition and analysis of supported devices. The unique Timeline feature offers convenient, single-place access to all activities and movements performed by the user arranged by date and time. Investigators can track user location at every moment, build and map their historic routes, and clearly see all activities performed by the user at each location. Another signature feature of Oxygen Forensic Suite allows investigators performing a global search on all devices ever analyzed with the toolkit. The global search quickly reveals any connections (e.g. common contacts, exchanged calls, texts or emails) between the phone owners. Oxygen’s statistical analysis tools allow investigators discover social connections between the users of multiple mobile devices. Calls, text messages and Skype conversations are analyzed to produce charts and tables revealing the users’ closest circle at a glance. Oxygen Forensic Suite 2012 guarantees zero-footprint operation, leaving no traces and making no modifications to the content of the devices, making it the tool of choice among government and law enforcement agencies, security services and forensic organizations in more than fifty countries. Founded in 2000, Oxygen Software offers the most advanced forensic data examination tools for smartphones and mobile devices. The company is dedicated in delivering the most universal forensic solution covering the widest range of mobile devices running Symbian, Windows Mobile, Blackberry, iOS, and Android operating systems. As a result, Oxygen Forensic Suite receives great response at forensic conferences, exhibitions and trainings, and occupies a spot in the top of the list in relevant tests for extracting more data than competition.